TNI Bureau: Shah Rukh Khan is expecting a lot from his upcoming film ‘Jab Tak Hai Jaan’, the last directorial venture of Yash Chopra, who recently passed away of Dengue. The film is slated to go on floors on November 13. SRK’s film is expected to rock the box office after giving outstanding shots in ‘Ra.One’. The film stars Katrina Kaif, Anushka Sharma, Rishi Kapoor, Nitu Singh and Anupam Kher besides King Khan. Akira (Anushka Sharma) wants to unveil the real story of Samar (SRK). She plays a role of a journalist working with the Discovery Channel. In JTHJ, Shahrukh will appear in two different avatars, one in his late twenties as a musician, based in London and the other at an older age as an introvert and dutiful army officer in Kashmir. As per the reports Katrina Kaif, who is playing the character Meera in the film, will appear as a typical Yash Chopra film heroine. But Katrina’s character looks natural in the film. Anushka is the second female lead in the film. Besides the main cast, while Rishi Kapoor is playing the character of Samar’s father in the film, Neetu Singh will be seen as Khan’s mother and Anupam Kher will be Katrina’s father. A teaser trailer of the film was released without title along with the theatrical release of ‘Ek Tha Tiger’ on YouTube on August 15. But it received a good response on the web after the main theatrical trailer was released on Sep 20 on Yash Raj films’ official YouTube channel. The film could be said as the last film of Yash Chopra, known as the “King f Romance”. 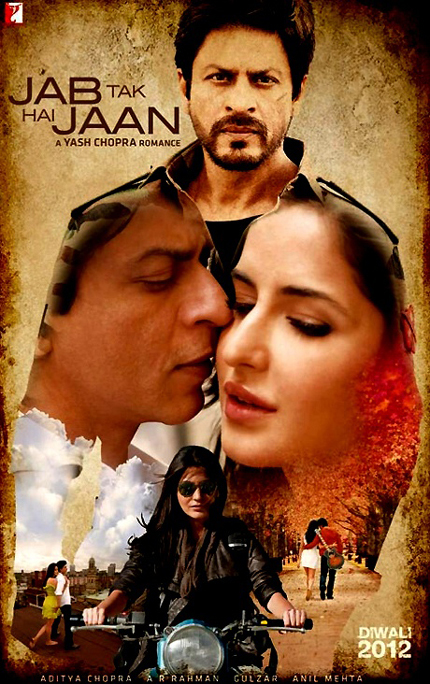 A grand premiere of ‘Jab Tak Hai Jaan’ will be held on November 12, 2012, a day before its worldwide release, in honor of the late director.